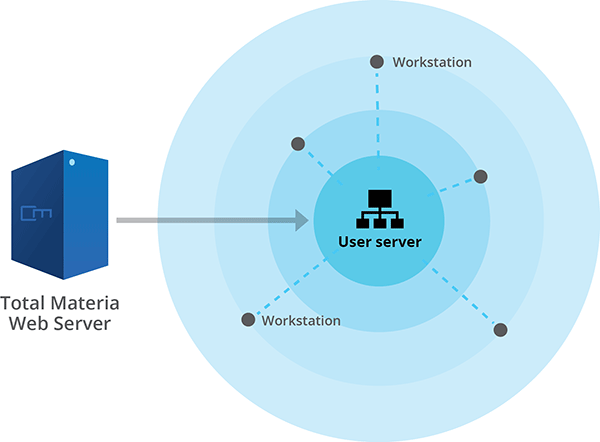 Multi-user web licensing with Total Materia is the most convenient and cost-effective solution for groups small and large, offices and enterprises. Distribute the informational power and knowledge of the Total Materia Databases with access incorporated into your intranet. You and all your colleagues can access the database on an "as needed" basis any time, directly within your corporate network. Network: Server-based license, serving small teams of engineers up to larger groups from multiple locations. Provides password free convenience and distributed access for mid-sized and larger organizations. Corporate: Server-based license, with unlimited number of users and unlimited number of servers. Perfect price/performance ratio for large companies and centralized resource centers. Up to 10 named users, designed for a small team in one location or spread across 3 locations. Up to 25 named users, designed for a small team spread across a maximum of 4 locations. Up to 50 named users, designed for several teams spread across a maximum of 6 locations. Global access for an unlimited number of users across an unlimited amount of locations. Turn-key solution, maintenance-free: No need to install, download, and maintain any software on your server and computers. Always up-to-date: Your users will always be working with the most recent and up-to-date version of the Database. Fast and easy access to the database and content: Users do not need to hassle with logins and passwords. Exceptional economy: This is the most cost-effective solution if you have several individuals who need access to material properties information. Many people can have access to the database information whenever they need it. Multi-user pricing is based on the number of named users and locations which require access to Total Materia with a cost effective solution for all eventualities. To see more information on product selection guidelines see our comprehensive multiuser price list.